I cook mushrooms almost every day. I use them in soups or saute them as a side dish. There are many different kinds of mushrooms and all of them have different taste. It is EASY and fun to create yet another recipe. I experiment combining mushrooms and mixing them with other foods and sauces. Mushrooms like other produce are more beneficial if organic.This dish has oyster mushrooms, bunashimeji mushrooms, and leek cooked in sesame oil, shoyu, caraway seeds and turmeric sauce. Put in a cooking pot olive oil, white and red quinoa, start warming up and mix. In a minute add water and sea salt. Let it start boiling, reduce the flame, cover with a lid but make sure it will not run away. Cook for 25 minutes. Soak beans in cold water for 6-10 hours or overnight. Discard the soaking water and rinse. Put 1 inch of kombu, soaked beans and water as much to cover beans through the cooking. After it starts boiling reduce the flame, remove foam, cover and cook for 60 minutes. Add a pinch of sea salt and cook for 10 more minutes. Cooked beans can be refrigerated for 3 days. Add sesame oil to the skillet and warm it up, Put sliced mushrooms and leek in the skillet, cook for 20 minutes on medium flame. Add turmeric, soy sauce and caraway seeds, mix well, cover and cook on the low flame for 5 more minutes. Mix in cooked black soy beans. 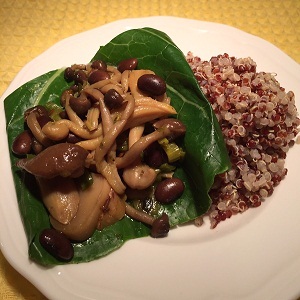 Serve on a leaf of blanched collard with quinoa.